Jeep has further extended the remarkably broad range of abilities offered by the Jeep Grand Cherokee, the most awarded SUV ever, with the addition of the Jeep Grand Cherokee Trailhawk to the 2017 New Zealand range. The Jeep grand Cherokee Trailhawk, which was first seen as a concept at the Jeep Safari, the annual event at Moab in Utah, delivers a unique and more rugged appearance, with a host of functional features that resulted in an increased level of off-road 4×4 capability. Grand Cherokee Trailhawk models are equipped with a host of standard off-road capability features, including Jeep’s Quadra-Drive II 4×4 system with rear Electronic Limited Slip Differential (ELSD), a unique version of Grand Cherokee’s Quadra-Lift air suspension – developed for Trailhawk – that offers improved articulation and total suspension travel, as well as Selec-Speed Control with Hill Ascent Control. Skid plates and a Trailhawk-specific anti-glare hood decal are also standard. The Grand Cherokee Trailhawk exterior features a front fascia and seven-slot Jeep grille that debuted on the 2016 Grand Cherokee 75th Anniversary edition, Trailhawk-signature red tow hooks in the front and rear, standard rugged 18-inch Goodyear Adventure off-road tires with Kevlar reinforcement, new Trailhawk and Trail Rated badges with red accents, mirror caps and a roof rack with Neutral Gray accents. 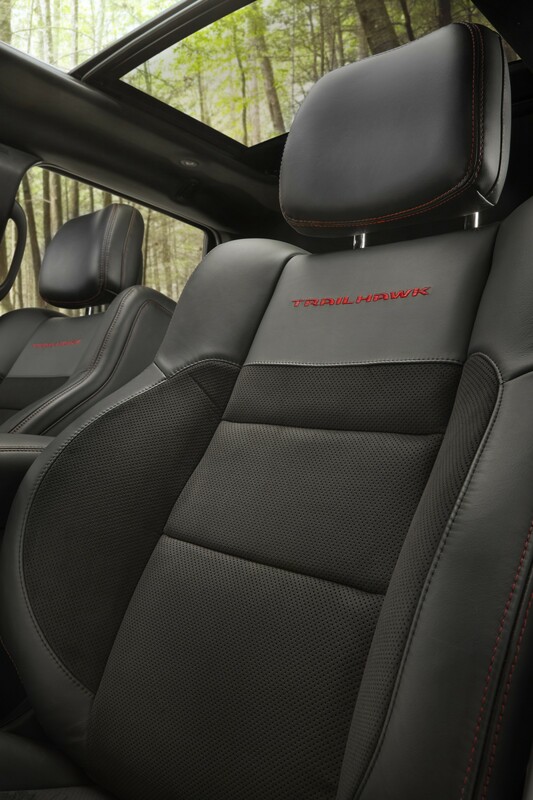 Inside, Trailhawk models feature a unique black interior with leather and suede performance seats for comfort and control, red accent stitching, brushed Piano Black appliques, gun-metal finish on all painted interior parts, a Trailhawk badge on the Jeep steering wheel, and red accent stitching on the seats, doors and console. 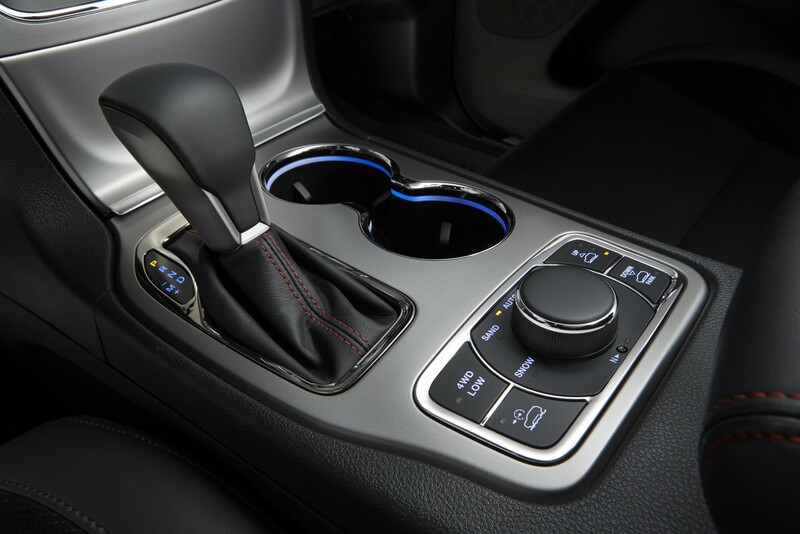 A standard 8.4-inch Uconnect touch screen includes updated off-road pages showing wheel articulation and other vehicle 4×4 capability features, such as suspension height and 4×4 and Selec-Terrain modes. 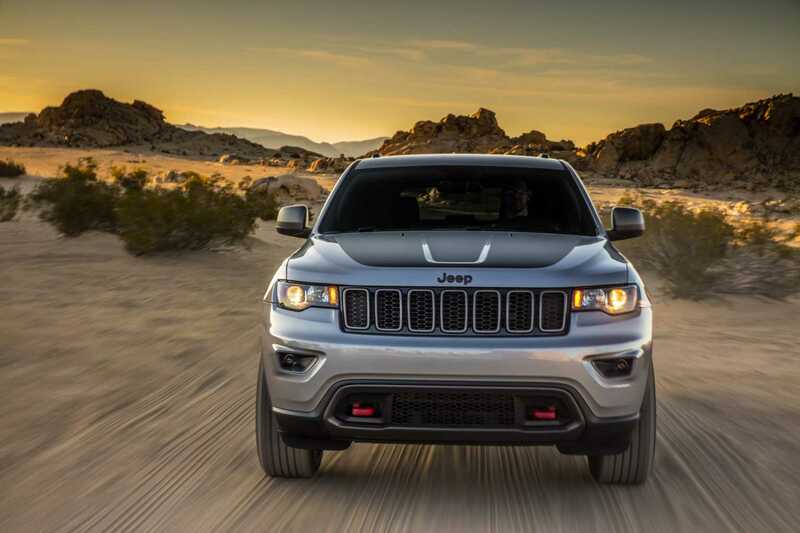 As standard the Jeep Grand Cherokee Trailhawk is fitted with the award-winning 3.0 litre Turbo Diesel engine which, with 550 NM of torque, is ideal for coping with the harshest of off road conditions, while the 184 kW of power makes it equally adept on the road. In addition to the arrival of the Grand Cherokee Trailhawk for 2017, Jeep has also made a range of enhancements and improvements to the whole Grand Cherokee range. These further add to the unique breadth and depth of abilities offered by the Grand Cherokee range, from the economy of the Turbo Diesel, to the blistering performance of the SRT, by way of the real SUV value for money offered by the Lardeo to the true rich luxury of the Overland. • 2017 Jeep Grand Cherokee Laredo, Limited, Overland, and Trailhawk models utilize front fascia and seven-slot Jeep grille that debuted on the 2016 Grand Cherokee 75th Anniversary edition. 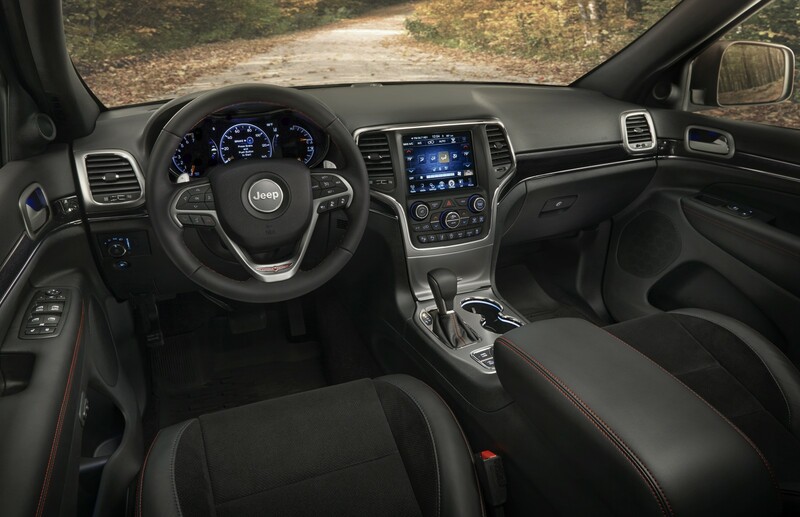 • Grand Cherokee SRT model features new, exclusive front fascia, fog lamps, grille and Signature leather interior package. • Rearview camera and rear park sensors are now standard on all Jeep Grand Cherokee models. The 2017 Jeep Grand Cherokee 4×4 has earned a five-star overall safety rating from the U.S. National Highway Traffic Safety Administration (NHTSA). Five stars is the highest single rating in NHTSA’s vehicle-evaluation program. This marks the fourth consecutive year the Jeep Grand Cherokee 4×4 has earned a five-star safety rating from NHTSA. The Jeep Grand Cherokee 4×4 earned top marks – five stars, the highest possible rating – in each test. And while restraint systems are critical to the Company’s safety strategy, crash-avoidance technology is also a high priority.